Wrapped in Culture is a collaborative project initiated by Rosalie Favell that brought together ten Indigenous artists from Australia and Canada for a three-week art collaboration to create a buffalo robe and a possum skin cloak. 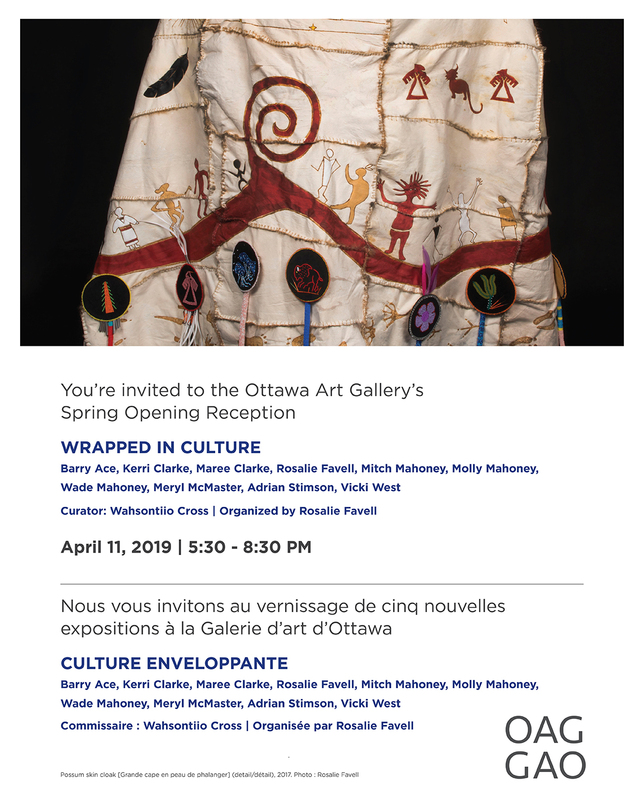 Completed in the Fall of 2017 the resulting robe and cloak will be displayed as part of an exhibition opening April 12, 2019 at the new Ottawa Art Gallery (OAG). The exhibition will be curated by Wahsontiio Cross, OAG’s RBC Emerging Indigenous Curator, will reflect the results of this collaborative experience shared in 2017. Also included in the exhibition will be a portrait series of by Rosalie Favell each of the artists in the Buffalo Robe and Possum Cloak. The exhibition will tour Canada and Australia. More info TBA.